We all know about the problem of plastics in our environment, Ug. Most of us are sick of seeing plastic everywhere. This is one way to turn it around and make waste plastic valuable as a source of energy, so people pick it up and stop throwing it in our oceans! The Dung Beetle prototype is a trailer-mounted movable art stage sculpted of recycled metal. It is being fabricated in Johannesburg, South Africa using South African skills and technology. It is a power-producing, fully operational plastic recycling system that turns single use plastics into diesel and gas. The prototype serves to inspire people to copy the free gasification technology. This disruptive technology educates and supports communities with positive messaging in conscious music, applied earth sciences and other crucial environmental successes. The solutions are all out there, and we want to help share them from our stage! The Dung Beetle makes environmental and science education fun, fiery and unforgettable. The system uses a gasifier built into the Dung Beetle’s “dung ball” and is a working invention that converts plastic trash to fuel using plasma gasification. No “burning” of the plastic happens, it is a closed system that up-cycles the waste plastic into usable low-emission fuels. 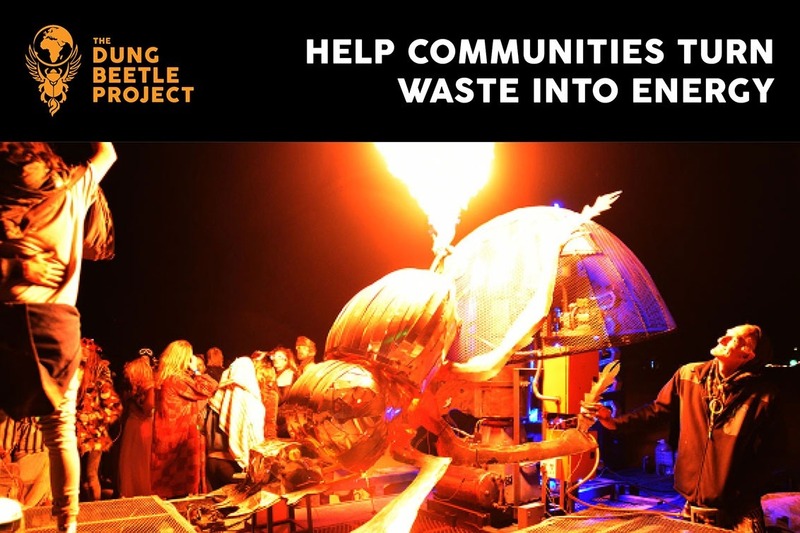 Using the art, the fuel and flames, the trailer becomes a traveling, dynamic, multimedia educational performance workshop that brings together change makers in communities across Southern Africa, and around the world. The main aim of this remarkable centerpiece for climate change and environmental education is to get communities talking to each other about how to solve these global problems. a) Syngas, like methane, that will power the generator which will in-turn power lights, speakers and the shows; as well as extra gas for use by attendees. b) Syngas will fuel two torches that burn and can shoot flame on command about 2 meters into the air out of the beetle’s upward facing bum to delight of the audience. c) Liquid fuel (low-emission bio diesel) which will power the truck towing the Dung Beetle and be able to be shared with other diesel vehicles.